Something unique happened after I posted that last message, First, Do No Harm. I received two e-mail responses, both fascinating. Because they were so thought-provoking, I asked permission to share. They are quite different in focus, so I’ll start with the first and save the second for next time. Aside from the obvious harm that statement does, this actually falls in the same category as writing "Mother was wonderful." I tell my students that generalities or grand pronouncements are vague, and we want to be perfectly clear when we write. It also is a lazy way of writing because they didn't think about what they actually meant. My mantra is, "prove it:" use examples that back up their statements. This doesn't solve the problem of this man having bad feelings about his son, but it allows the reader to determine for himself that the son was lazy. But if the aim was revenge or vindictiveness, no number of examples will make the writer seem anything other than mean spirited. Who could question the motivation behind that statement or the father's intention? The writer has stuck to the facts. He has not engaged in theatrics or blaming by telling how BB “broke his mother’s heart” or “lived a life of sin and desecration.” As sad as the situation is, we can understand both the message and the father’s rejection. Surely other family members will also be less appalled that they would be if they read that single sentence. There are any number of variations on this theme. The writer could include more of his own feelings. He could expand the paragraph to include more detail. It sounds as if there is enough material to fill a full volume. But whatever length and level of detail, it will be most effective in conveying the father’s reasoned conclusions if it sticks to facts and personal perceptions or reactions rather than simplistic name-calling. As a side note, writing an explanation of this nature may not come easily. It may take several drafts to knead out the toxic emotional waste and focus on the essence of things. But as you work on your drafts, you may experience a bonus dividend: you may feel your heart lighten and a burden lift from your shoulders. You may finally feel a modicum of peace around the issue. Exercises like this are heartily recommended by many psychologists and physicians as a strategy for dealing with stress. Note: the descriptive paragraph above is totally fictitious. I know nothing whatsoever about the circumstances of the actual situation, nor do I know any of the people involved. Furthermore, my own two sons and daughter are happy, healthy, tax-paying members of their communities, parents of two amazing children each, and a source of great joy and satisfaction. Write now: think of a person you might be inclined to dismiss with a single sentence of disdain and write a paragraph or more explaining why you feel such anger, disgust, betrayal, or other negative feeling. 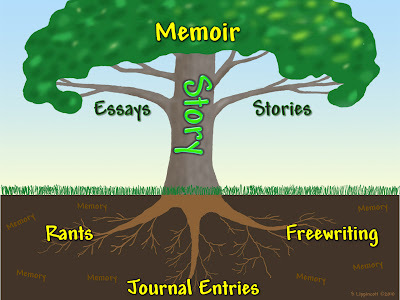 You can use your journal for free writing or write a draft of a longer story about the situation. Just write it. For the health of it. It doesn't need to be included or attached to a legal document to be worth doing. Quite a dilemma, that "do no harm." Because of it, I am stuck at a certain point in a manuscript about care-giving a spouse with Alzheimer's. The non-fiction story is at a point where the words and actions of a relative added immeasurably to my already devastating burden. So, how to tell what happened without making him look like the biggest schmuck of all time? Even narrating only the straight-out facts would cast him in an evil, selfish light. So, I remain stuck because the story is not about the patient, but about me and how I survived Alzheimer's. Editing negative comments works fine while writing; how do you apply that to a recorded conversation. I guess I can answer my own question - by asking questions that require more factual, descriptive answers (and through careful editing of the final CD), I see how you could achieve the same goal. Without knowing more specifics, I can only answer in a general way. Perhaps you don't have to include the specifics of He said, I said, but summarize the drift and focus on your reactions and the effect his words had on you. The challenge is not to avoid telling Truth. It isn't even to avoid "hurting" everyone. The point I'm trying to make is to avoid name calling and vengeful, spiteful accounts that are specifically intended to be hurtful. By focusing on your reactions, you remain the focus, and the ability to transcend his hurtful actions is part of your survival story. I'm assuming that you are interviewing someone in these recordings. With practice, you can learn to recognize the danger points and ask clarifying questions to get more information. Essentially that will serve the purpose of this post, eliciting the back story that explains the venom. I'm glad to hear that you do have the ability to edit out some sections. One of the benefits of recordings is their ability to capture the spontaneity and raw reality of a person's spirit. That benefit can also be a flaw when people blurt out uncensored thoughts that may best be left unsaid, and in the recording they are preserved for posterity. Interesting take on the situation. Her description is wonderful! Thanks for sharing that.